Next time I go ice skating, remind me to never accidentally fall through the ice. One of the fun things we did while we were up in Tremblant (photos here) was go to the beautiful Scandinavian Spa for an afternoon. It's a complex of outdoor hot tubs and cold tubs, and indoor steam rooms, saunas, and warm "relaxation rooms", with full spa services offered if you're in the mood (we both got massages - my second one ever). The idea is to alternate between warm places and cold places, for an authentic Scandinavian experience. It's supposed to be good for you, they say, and it's definitely fun. 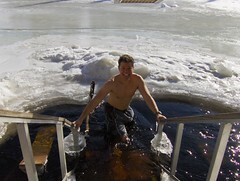 If the 57-degree plunge pool or waterfall isn't enough for you, there's the option to take a dip in a hole cut in the ice in the Diable River. And how often do we get the chance to do that? We just had to give it a try. After all, it was by far the warmest day of our vacation (a balmy 25 degrees - that's Fahrenheit, my foreign friends). Well, getting in is surprisingly easy. By the time I was up to my waist, though, my feet were telling me to get out. Very insistently. The bigger surprise was then the searing pain about ten seconds after getting out - there were about 30 seconds where I doubted I'd ever be able to stand again. Yet I survived, and so did Sue. And then I had to do it again because Sue somehow didn't get a good photo of me in the water. And what's the point of doing it if there's no proof? People ask me how Sue can put up with all the photos I take - well, I'm willing to suffer for my photography habit, too! There was no suffering the rest of the day; if we hadn't had to get back to our hotel to pick up Violet from daycare by 4:30, we could have stayed there warming and chilling (literally and figuratively) all afternoon into the evening. But not in the river again. We got our story and our photos and that's enough.